In the latest best practice video developed by the Honey Bee & Pollination Program, one of Australia’s most respected apiarists has encouraged honey producers to adopt rapid hygienic behavior testing in an effort to limit pest and disease incursions. In the fifth episode in the series, Lindsay Bourke from Australian Honey Products in Launceston, Tasmania, explains his technique for testing bees for hygienic behavior, and the importance of the practice. “Everyone should be doing it; guessing is not good enough,” Mr Bourke said. “A bee with rapid hygienic behavior gets less American foul brood and they will also be set up to be able to detect Varroa destructor compared to a bee that doesn’t have it,” he said. “Biosecurity is important to our company also because we know that healthy bees will produce more honey and of a better quality. In the video, Mr Bourke demonstrates step-by-step how to apply liquid nitrogen to the brood. 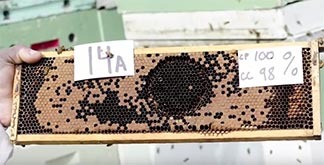 This practice temporarily freezes the brood allowing a beekeeper to then test the percentage of cells the bees uncap. “If 95 per cent of the brood tested is uncapped 24 hours later, then that indicates a wonderful queen to breed from,” Mr Bourke said. AgriFutures Australia Program Manager for Research and Innovation, Dr Melanie Bradley, said protecting industry biosecurity and bolstering healthy queen bee breeding lines is a crucial focus for industry. “The honey bee and pollination sector is acutely aware that Varroa is very much on our doorstep,” she said. The Honey Bee and Pollination RD&E Program is a jointly funded partnership with the AgriFutures Australia, Horticulture Innovation Australia Limited (Hort Innovation) and the Australian Government Department of Agriculture and Water Resources. AgriFutures Australia funds are provided by honey industry levies matched by funds provided by the Australian Government. This project has been funded by Hort Innovation using the Research and Development apple and pear, almond, avocado, cherry, dried prune, summer fruit and onion industries levy, voluntary contributions from the melon and canned fruit industries and funds from the Australian Government. AgriFutures Australia is the new trading name for Rural Industries Research & Development Corporation. AgriFutures is a trade mark owned by Rural Industries Research & Development Corporation.